Interesting new twist to the Pope Joan story, from researcher Michael Habicht at Flinders University in Adelaide, Australia. Basically, according to the article, “The deniers Habicht examined were minted with the name of the emperor of the Franks on one side and the pope's monogram — a symbol made using a person's initials — on the other side. Habicht focused on coins previously attributed to Pope John VIII, who reigned from 872 to 882. The archaeologist said that while some deniers possessed a monogram belonging to Pope John VIII, earlier ones had a significantly different monogram. "The monogram that can be attributed to the later John VIII has distinct differences in the placing of letters and the overall design," Habicht said. 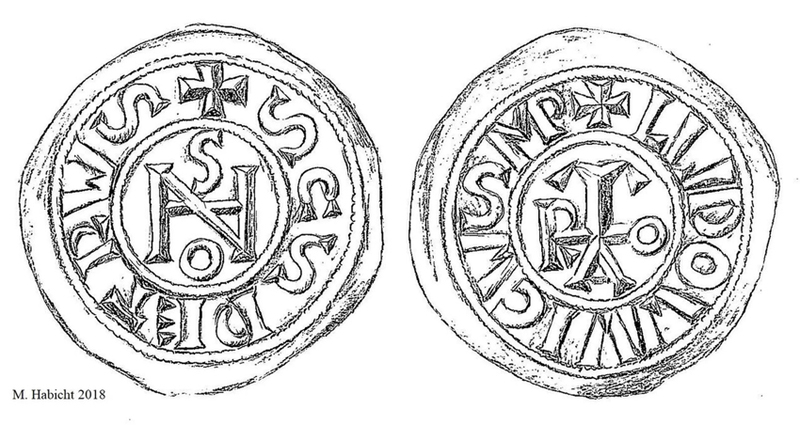 These other coins may have belonged to a different Pope John — Johannes Anglicus, the potential Pope Joan, Habicht said. He noted several historical sources that suggested a Pope John reigned from 856 to 858. For example, the chronicler Conrad Botho reported that a Pope Johannes crowned Louis II of Italy as Holy Roman Emperor in 856, Habicht said. "The monogram was the forerunner of today's signature," Habicht said. "Thus, we probably might even have a kind of signature of Pope Joan." This is why Habicht’s coin has been attributed to John VIII, since he was the only pope John in an emperor Louis reign in the ninth century. Pope John IX reigned 898-900 (5 January), while Louis III (“the Blind”) was emperor February 901-905, so there is no overlap between the next two pope and emperor with those names. The difference in the monograms of Habicht’s Pope Johannes Anglicus (856-858) and John VIII (872-882) seems to be merely the placement of the S and O in the design. So Habicht may have a point. A book length study suggests he has done due diligence in excluding all other solutions to the problem, such as John VIII changing his monogram for some reason from the early days to later in his papacy.